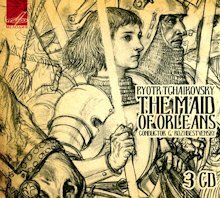 In remarkable contrast to the preceding Eugene Onegin, Tchaikovsky’s fifth surviving opera The Maid of Orleans (1878-81) emulates French grand opera, mixing grandiose pageantry with melodramatic passages against a pseudo-historic background – the intervention of Joan of Arc in the Anglo-French war in the early 15th century. Unlike its predecessor, The Maid of Orleans never achieved a firm place in the international opera repertory. Riddled with a flawed, patchwork libretto penned by the composer himself (largely based on Schiller’s tragedy, but also the libretto by Jules Barbier and other sources) the opera may be overblown and dramatically uneven, yet it doesn’t deserve its status of virtually complete neglect amongst Tchaikovsky’s output either. There is plenty of splendid music to enjoy, in effect quite a lot more than in several other, more reputed operas – try the famous aria in Act 1, sometimes heard in concert programs, where Joan takes leave of the world she has known since childhood, but also her narration in Act 2, the two love duets with Lionel in Act 3 and 4, and the final scene. Categories: CD reviews | Tags: Eugene Onegin, Gennady Rozhdestvensky, grand opera, Irina Arkhipova, Joan of Arc, Maid of Orleans, Marc Haegeman, Melodiya, Meyerbeer, Piotr Ilyitch Tchaikovsky, Russian music, Russian opera, Schiller, Tchaikovsky | Permalink.